Are you in search of the best RDTA that money can buy? Looking for the best RDTA for flavor, or perhaps you're in search of the vape that'll get you the biggest clouds. 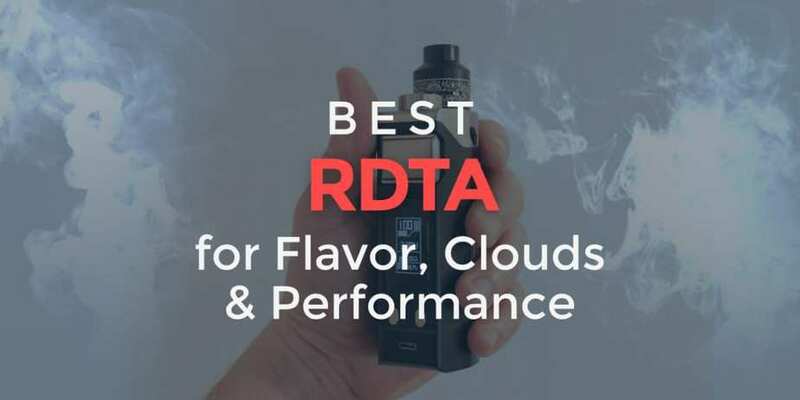 Whatever you're looking for, we've compiled reviews of the best performing RDTAs we've found on the market. These reviews are based on our staff's personal experience with the products, and on feedback we receive from fellow vapers in the vaping community. The Faris is a very unique and different RDTA made by Wotofo, and you can seperate the tank section of this atomizer to transform it into an atomizer that can even compete with some of the Best RDAs. If you use it in RDA mode it comes with a BF pin, so if you enjoy squonking, you can use it as a BF RDA if you desire. It has an overall diameter of 24mm, so you can pair it with most box mods on the market today. The Wotofo Faris RDTA has a maximum e-juice capacity of 3ml and has two large fill ports on the side of the build deck. You can adjust the airflow using the middle cap and each side has three large airflow holes. The Faris has a postless build deck and has a peek insulated positive post. The Wotofo Faris RDTA is made out of 304 stainless steel material and includes a wide bore resin drip tip, matching the color option you choose. It does include a couple gold plated pins, an extra wide bore delrin drip tip and a 510 drip tip adapter. If you’re after an atomizer that can provide you with multiple vape experiences, then definitely consider adding this to your collection. The Vandy Vape Pyro V2 RDTA is the updated version of the original Vandy Vape Pyro RDTA. This model has a completely new look with a cog-like design, so it’s quite eye appealing. Just like the original, this atomizer has a 24mm diameter and holds a maximum e-juice capacity of 4ml. The Vandy Vape Pyro V2 RDA has a gold plated postless build deck, and with many decks like this, it’s very easy to build on. You can fill this atomizer using the convenient top fill design and there are silicone stoppers on the top cap, ensuring your e-liquid is secured. This RDTA includes a ton of extra spares and you can adjust the airflow via the knurled top cap cap. The flavor is definitely on par with the best RTAs on the market. Overall, the Vandy Vape Pyro V2 is a great atomizer from performance to looks. There is even a Project Sub Ohm Edition, if you are a fan of limited edition atomizers. If you are looking for a new RDTA that doesn’t break the bank, then this is one we recommend. Limitless Mod Co. is a company known for making a ton of RDTAs in the past, and the RDTA Prime is their latest addition.This atomizer is constructed out of stainless steel material and has a knurled design in the middle, making it easy to take apart. 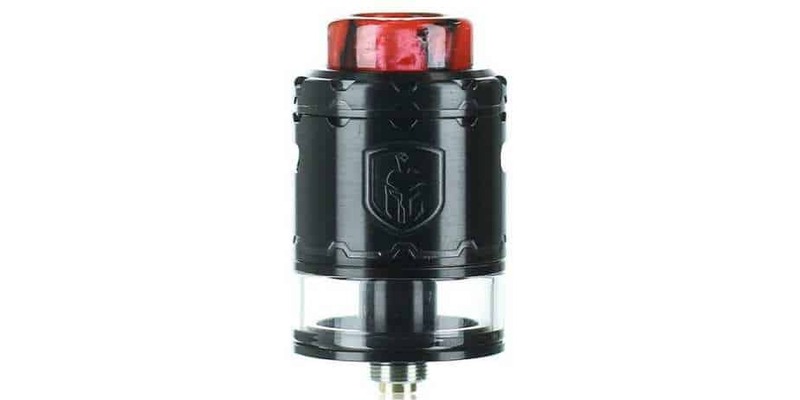 There is a wide bore drip tip attached to the knurled top cap, which is used to adjust the airflow. The Limitless Mod Co. RDTA Prime has a dual post build deck and is designed specifically for dual coil builds. There is an ultem plug on one of the build posts, that is where you fill the tank section, so it is easy to fill. This RDTA has a unique design with the company logo written on the top cap in a script writing and the logo at the bottom. The Limitless Mod Co. RDTA Prime is a solid cloud chasing RDTA, and with its build deck you can fit a variety of coil builds. It has a large 26mm diameter and holds a maximum e-juice capacity of 5ml, so you won’t be needing to fill too often. If you’re looking to cloud chase with big dual coil builds, then look no further. The Steam Crave Aromamizer Titan RDTA is a very distinctive atomizer from the size all the way to the design, it has a 41mm diameter making it one of the largest atomizers on the market. It holds a maximum e-juice capacity of 28ml and includes an extra 28ml glass section. You can shorten the e-juice capacity to 18ml using the other shorty glass tank section also included. The Steam Crave Aromamizer Titan sports a large postless, series modular and a two post velocity style modular build deck, giving you at on of options for builds and can literally fit any of your best coils for flavor. This tank has a knurled design on the top and bottom, which makes it easier to take apart and put together. Overall, if you are looking for a new completely different and unique RDTA, then look no further than the large 41mm Steam Crave Aromamizer Titan. 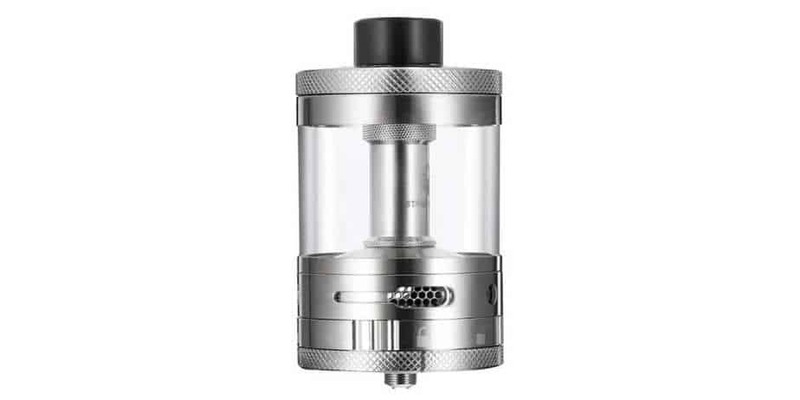 It is constructed out of stainless steel material and comes with a large wide bore drip tip. It has a large adjustable bottom airflow slot, which is fully adjustable. 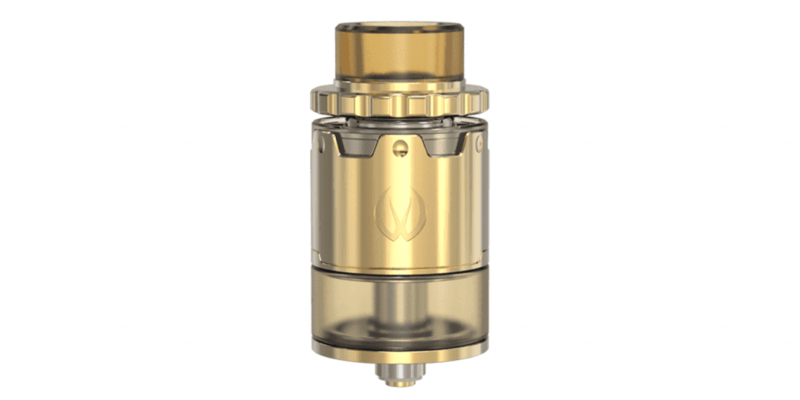 The Oumier Wasp Nano RDTA has an overall diameter of 22mm and is primarily constructed out of stainless steel material. The top cap is crafted out of delrin or ultem material, so it stays cool even while chain vaping. This tank has a maximum e-juice capacity of 2ml and is filled by the wick ports in the build deck. 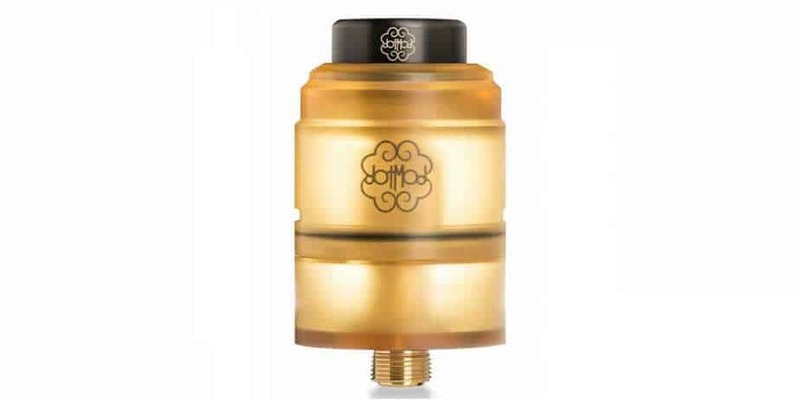 The Wasp Nano RDTA features a dual post build deck that is designed for single coil builds. There is a dual slot side airflow design, that you can adjust by simply rotating the top cap counterclockwise to close or clockwise to open. If you prefer 510 drip tips you attach one to the top of the cap or just use the top cap if you preferred. The Oumier Wasp Nano RDTA is a great single coil atomizer for a couple reasons, the first is that it’s great for beginners, another is the easy fill method and the last is it is easy to take apart for cleaning purposes. If you are a fan of Resin Finishes there are 3 different resin color options as well. The DotMod DotRDTA is made out of Ultem material, so it is heat resistant, and looks completely different from the competition. This atomizer has a gold plated spring loaded clamp style build deck and has an overall diameter of 24mm. Included in the package is an extra wide bore acrylic drip tip, if you want to change the color patterns. DotMod is a popular company that is known for making quality mods and atomizers and the same can be said for this RDTA.. Each product they introduce is very well crafted and performs very well. You can always find their signature logo of the company printed on the front of the atomizer or mod. The DotMod DotRDTA has a maximum e-juice capacity of 2ml and you can fill the tank section at the center of the atomizer. In addition, it has a non-adjustable side airflow design, but gives the perfect draw. You can use horizontal coils, vertical coils and mesh coils with this style build deck, which is a huge pro in our book. If you’re a fan of DotMod, or simply looking for a premium RDTA, then this is one worth checking out for sure.